At Lake Dental, the comfort and wellbeing of our patients is of utmost importance to us. 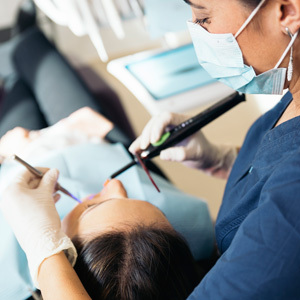 That’s why we also offer advanced techniques and services, including sedation dentistry, to ensure our patients have nothing but a positive experience in our care. Our sedative options can be used in a wide variety of dental treatments and procedures, including cosmetic, restorative, or general dentistry. Just one of our commonly administered anxiety management techniques includes what is known NuCalm. It is an advanced sound and vibration technology that ensures our patients are properly relaxed for any procedure. Additionally, we also offer inhalation sedation (commonly referred to as “happy gas”) for patients experiencing mild anxiety in relation to a procedure. This is administered by breathing gently through a nasal mask. If dental anxiety or phobia is stopping you from receiving the oral care and treatment you require, don’t put it off any longer. Please contact (07) 3879 8999 today to discuss how our sedation dentistry can help you!